Quite well-stated memo, 'tis said. To find the most accurate price. On setting of rates was pervasive. Simon Johnson writes in his Baseline Scenario blog that the Federal Reserve Bank of New York may have missed an opportunity to inform its counterparts at the Bank of England of the LIBOR manipulation occurring back in 2008. Interbank traders active in the LIBOR-setting process had plainly admitted to the New York Fed that they gave self-servingly false indications of the rates at which their banks could fund themselves. 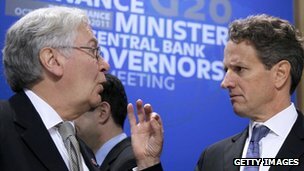 Understandably concerned, the FRBNY's then-president Timothy Geithner spoke with the English central bank governor Sir Mervyn King, and followed up with a memo outlining his staff's recommendations for improving the LIBOR process. The memo, a model of brevity and clarity, outlines six proposals to improve the accuracy of LIBOR, which is based on funding rates reported by US and other international banks in the London market. Among the proposals: "Eliminate the incentive to misreport" by randomly selecting quotes from a subset of reporting banks. What the memo did not mention was that the Fed already had admissions of fraudulent reporting from some of those banks. How might things have turned out differently if it had? Nothing like a three-verse limerick. Nice job!